MASON, Ohio -- A former Mason High School student is a person of interest in the violent beating of a black man at Saturday's white supremacist rally in Charlottesville, Virginia, police there said. Social media activists claim photos and video show Dan Borden violently beating Deandre Harris with a pole in a parking garage. Sgt. J. Via, with the Charlottesville Police Department, confirmed Tuesday afternoon Borden is now considered a person of interest. The social media campaign that named Borden on Twitter was part of a national effort to "name and shame" individuals who participated in the gathering. Through those efforts, there have been some instances where men in other parts of the country were falsely accused of taking part in the event . WARNING: The below video contains graphic images and language. Borden attended Mason High through his junior year but did not return for his senior year, Mason City Schools spokeswoman Tracey Carson said. A classmate at Mason Middle School told police in 2012 that Borden held a knife inches from his face. He also said Borden drew swastikas, called him "Jew Boy" because he had a big nose and claimed he belonged to a gang called Brothers of Confederacy. Another student said Borden said he was going to kill him because he wouldn't buy Borden a cookie. Borden said he was joking. Mason Police Officer Joshua Wells said police charged Borden with possessing a deadly weapon in a school safety zone and aggravated menacing. Two years later, he was charged with disorderly conduct. According to a police report, he made statements about a shooting at Mason High and told friends they shouldn't go to school that day. Written statements from classmates indicate they didn't take him seriously and it was just "Dan being Dan." In all, the Mason Police Department had seven contacts with Borden. After Saturday's attack, Harris told WRAL in Raleigh, North Carolina doctors used eight staples to seal his head together. He also broke his wrist, chipped a tooth and had a busted lip. 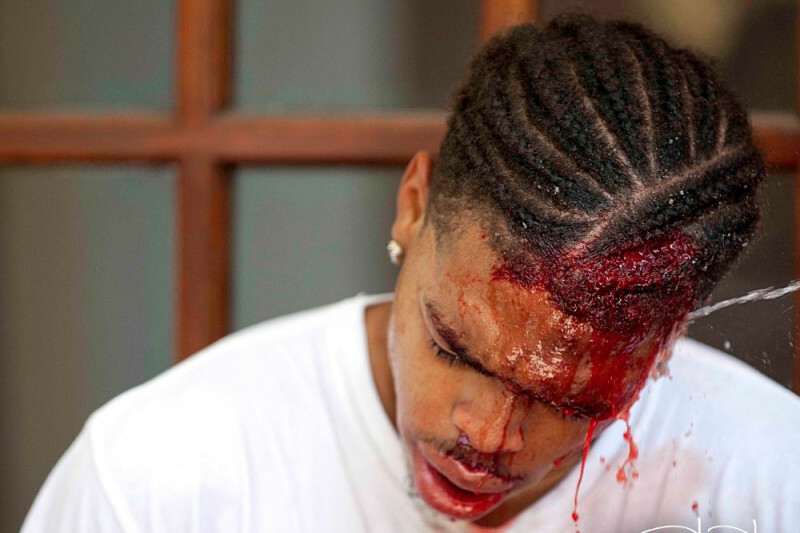 "I'm on my knees just getting beat with poles and signs and being kicked and hit," he said. "It's crazy." Millions of people have seen photos and video of Harris' beating through Twitter, Facebook and other social media. Mason Police Chief Todd Carter said Borden no longer lives in the city. The police department doesn't know where Borden is and isn't looking for him, Carter said. Miriam Dickler, Charlottesville city spokeswoman, said police want to hear from anyone else who was attacked or witnessed an attack. "What we want to know is if other things happened that we're not aware of, we want to make sure those things are investigated fully," Dickler said. Two Centerville, Ohio men are accused of participating in a torch-lit march and chant alongside other white supremacists. Photographers claim they captured images of the two men and have spread them online to millions. A police spokesman said they no longer live in the area. The weekend's events resulted in widespread fights in downtown Charlottesville between participants and counter-protesters. Two Virginia highway patrol officers died when their helicopter crashed after Saturday's rally. James Alex Fields Jr., 20, is suspected of ramming his car into a crowd of counter-protesters earlier in the day, killing 32-year-old paralegal Heather Heyer and injuring 19 other people. Fields recently moved to the Toledo, Ohio area but grew up in Northern Kentucky . Classmates and a former teacher said he openly embraced Nazi ideology . News of the local connections quickly spread online, and officials sought to distance themselves from their reported actions. Multiple attempts to reach the men for comment were unsuccessful.